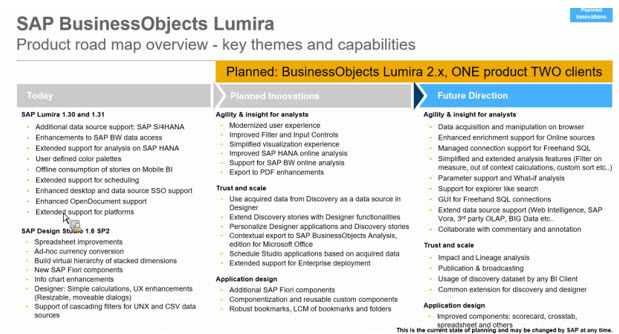 SAP Lumira Roadmap Call was held a few weeks ago. You can watch the recording here. 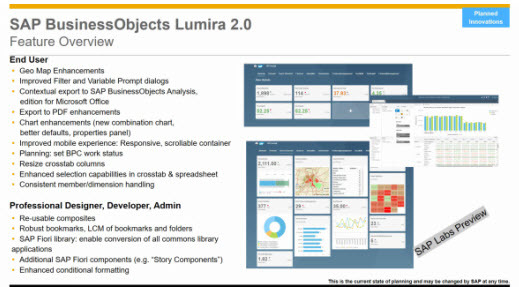 Lumira 2.0 Designer has new features and functions, including geomap enhancements, export data into SAP Analysis Office and use Office to do further analysis. Q: Lumira 2.0 can be considered a Tableau or Qlikview competitor ? Q: product is this mobile accessible? Q: How much data that the velocity engine can handle? Q: With Lumira 2.0 even though it’s one product, it has 2 client interfaces to cover self-service scenario and dashboarding scenario’s when compared to a competitor like Tableau who has one product and one client interface which seems like a better and simplified approach. What are the advantages of SAP’s 2 client interface strategy compared to its competitors? Q: variables of variants something like in web application designer will be support? 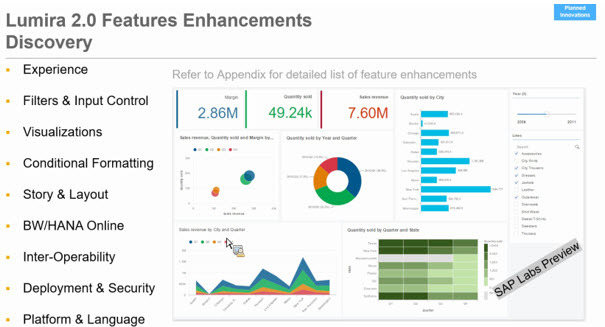 Q: Is their any new templates delivered as a part of Lumira 2.0 like we have in Design Studio in 1.6 Version ? Q: is possible to refresh the data in the velocity engine. Q: Web Intelligence as a data source to Discovery? Q: My client is new to Lumira, do we need to install lumira tools on the server side inorder to use the Lumira discovery tools/Lumira design studio ? Q: Can webi last instance be used as data source? Q: Lumira Server license – what about mobile user? Q: Rapid release cycle – any plans to go back to a 6 month or quarterly release?